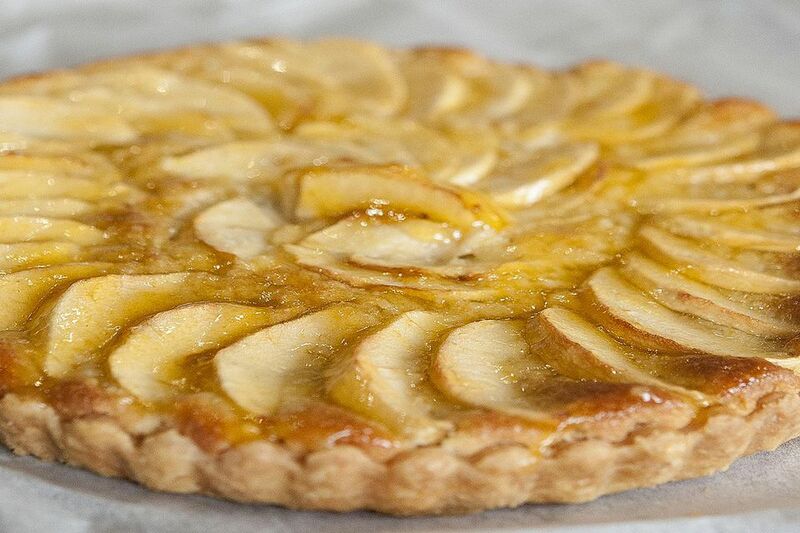 This Apple and Almond Tart comes from renowned baker, Brendan Lynch. Brendan is best know from his appearance and as finalist on the Great British Bake Off but is also rapidly becoming better known for his exemplary teaching skills. He can be found as a guest tutor at Cooks, the Carlton School of Food in Yorkshire. The tart pastry is a classic pate brisée which you may often see called sweet pastry. Mix flour, salt, and caster sugar together in a medium-sized bowl. Rub butter into flour to resemble fine breadcrumbs.Add egg and just enough milk to form soft/firm dough. Knead for a minute, shape into ball and put on plate and cover with Clingfilm and let rest for 20 minutes in fridge. Grease a 9 inch fluted or unfluted tart tin. Roll out pastry to thickness of a £1 coin. Transfer to tin and press the pastry into sides with a small ball of dough. Leave about a 1 inch overhang of pastry and cut the rest away with a scissors. Line pastry with non-stick parchment paper so that it projects beyond the pastry. Fill to near top with rice or beans ensuring that the sides are supported by the dry material. Let stand for 20 minutes in fridge. This recovery period will reduce pastry shrinkage during baking. Preheat oven to 180°C for 15 minutes. Have an egg white that is lightly beaten ready to seal pastry before 2nd bake. Transfer to preheated oven and bake for 12 minutes. Remove from oven and using the parchment to help you, lift the dry contents away from the pastry shell. Prick the base all over with a fork to reduce puffing up.Brush the pastry shell with the egg white. Return to oven and bake for 8 – 10 minutes. You are partially baking the shell which will complete its baking with the almond cream and apples.Remove from oven and let cool on rack. Peel and quarter the apples and remove core with seeds. Slice the quarters thinly. Put the butter and sugar in a bowl, and using a hand-held whisk, of a food process until the mixture is smooth, light and satiny. Add the ground almonds and continue to process until well blended. Add the flour and cornflour, whisk again, and then add the egg. Whisk for about 15 seconds more, or until the almond cream is homogeneous. Add the rum or vanilla and whisk just to blend. Starting with the outside circle, place overlapping slices of apple all the way round the shell covering the almond cream beneath. Do the same with the second inner circle. The final inner circle can be completed in this way. Or alternatively, stand each apple slice at a 35 degree angle to form a ‘flower-type’ pattern in the middle. Sprinkle the slices with 85g caster sugar. Bake in preheated as before for 20-25 minutes till apples are soft. Make the apricot glaze by gently heating the apricot preserve and water until dissolved and then push through sieve to remove fruit pieces.